Ableton Live 9 Video Tutorial Roundup! Audio-to-MIDI, Glue Compressor, Session View Automation, and More! 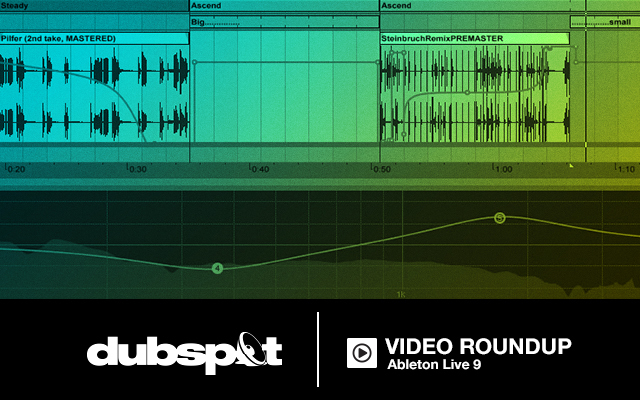 In this edition of Dubspot’s DJ / Producer Tutorial Roundup, we’re revisiting five videos that show off some of the exciting new features of Ableton Live 9 including audio-to-MIDI conversion, the new Glue compressor effect, session view automation, and more. Of all the improvements in Ableton Live 9, the thing that excites me the most are the new audio-to-MIDI conversion tools. In this tutorial, I will take a simple guitar riff and turn it into an aggressive industrial-style synth bass by converting the riff to MIDI and using the notes to trigger Native Instruments’ Massive synthesizer. My main instrument is the guitar, not the keyboard. I write differently when playing guitar and I come up with melodies that would never have occurred to me if I was sitting down at a keyboard controller. With these new functions in Ableton, I can now start a new track on my guitar, record my playing into Live through my audio interface, and convert my riffs into MIDI files. Then I can take my guitar melodies in new creative directions by assigning the MIDI data to control different synthesizers and samplers. Another great benefit here is that I do not have to purchase additional any gear to convert my guitar output to MIDI, everything I need is built into Live 9. Ableton Live 9 has a lot of new features to help improve your workflow and streamline the process of getting creative ideas out of your head and into the software. One of the new features I have found most useful is the ability to record automation directly into clips in the Session View. In this video I use this new feature to record myself changing the quantization of my drums in real time using the Arpeggiator. This video is actually two little tutorials in one, because the idea of using the Arpeggiator to change drum quantization is something that may be new to a few of you. This particular technique can be used in Live 8 as well, so if haven’t upgraded yet you can still implement the idea of using the Arpeggiator in the way you’ll see demonstrated. More start dates and information about payment plans can be found here. 10% off all courses in NYC + Online, and 25% off for 2014 courses! Reserve the last remaining seats in 2013 at a 10% discount right now. Or take 25% off courses starting in 2014 by entering promo code EARLYBIRD14 at checkout.